We’re two months into this new diet change, and things are going too bad. It gets easier each day, although I still spend a LOT of time in the kitchen. I have been really lucky, and the family has taken to the no-cereal-for-breakfast rule quite well. And while I am thrilled that they are eating oatmeal for breakfast (it’s food for you and easy to make, especially if you use my Instant Pot Steel Cut Oatmeal recipe), there are days when we either make too much, or the kids just aren’t as hungry, and we’ve been left with lots of oatmeal leftover. Not a huge problem in itself, but not everyone in the family will eat re-heated oatmeal. That joy belongs exclusively to our teenager, who, like pretty much every other teenage boy out there, will eat just about anything as long as it stays still long enough for him to shovel it in his mouth! I hate throwing away good food though, so I’ve been trying to find ways to incorporate the leftover steel cut oats into other recipes. The success rate, however, has been abysmally low. One thing that my kids have missed while on gluten restriction has been pancakes. I can do them dairy-free, I can do them soy-free, but doing them gluten-free has been harder. I thought that maybe I could use the leftover oatmeal to make gluten-free pancakes, but alas, oatmeal by virtue of it’s no-gluten-ness, lacks the structure to make decent pancakes. Trust me on this one. Now, that’s not to say that you can’t use oatmeal flour, because I’ve done a couple of those, but cooked oatmeal just isn’t up to the task. We have since added gluten back in our diet now that the elimination period is over, and it doesn’t seem to be negatively affecting anyone. So I think we’re okay on that front. Which means that I can use some regular flour in recipes, and that opens a lot more possibilities now! And so my attempts at Leftover Oatmeal Blender Pancakes were finally successful!! I don’t know if you could use gluten-free baking mix for this, but I suspect that you can, if you still need to keep them gluten-free. I’ll try some next time. For right now, I’ve been using regular flour, or even better, freshly ground wheat flour. 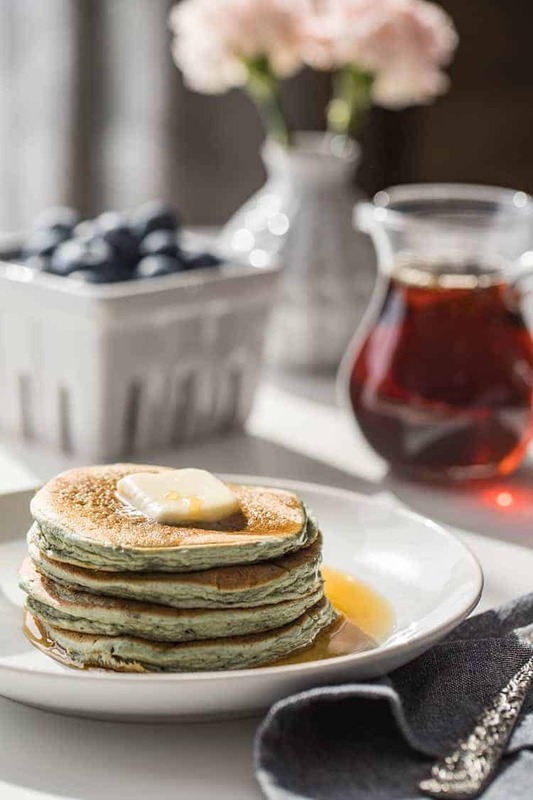 You will need to cook these just a little longer than your normal pancakes, as the oatmeal can tend to make them a little mushy and doughy on the inside. So just be aware. And you’ll want to do these in a high-powered blender, like a Blendtec or Vitamix. (I have not tried them in a Ninja – I have a Blendtec – so someone give a shoutout if they try them in the Ninja and let us know if they work.) It’s just to get the steel cut oats blended down to a puree consistency so you can sneak them into the pancakes. If you don’t mind chunky pancakes, I suppose you could try just mixing the oatmeal in without a blender. 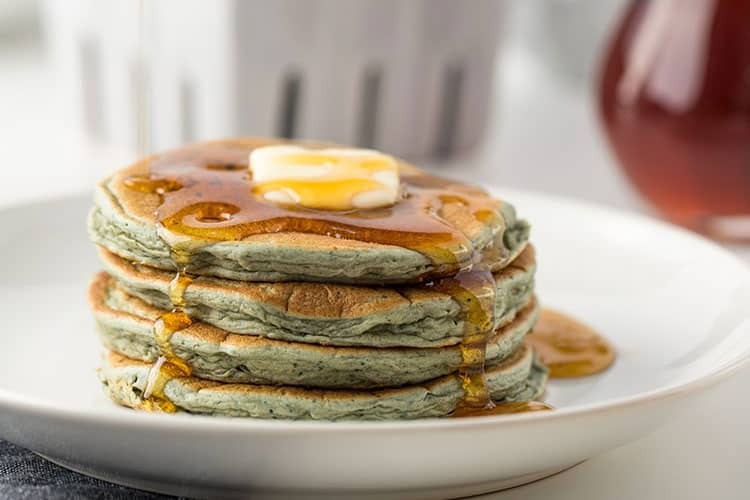 Now, you’ll have to excuse the odd color on these – this particular batch was made with blueberry banana oatmeal, so the pancakes were very blue-green! But despite the slightly odd color, they taste terrific! If your kiddos would be put off by the color, use plain oatmeal or use a batch that has other fruit (or pick the fruit out). However, strawberries will give these a great pink color which can be kinda fun! I’m just happy to have a way to use of my leftover oatmeal, and the kids have gone nuts for these, so I think it is a win-win! Hope you enjoy them too!! 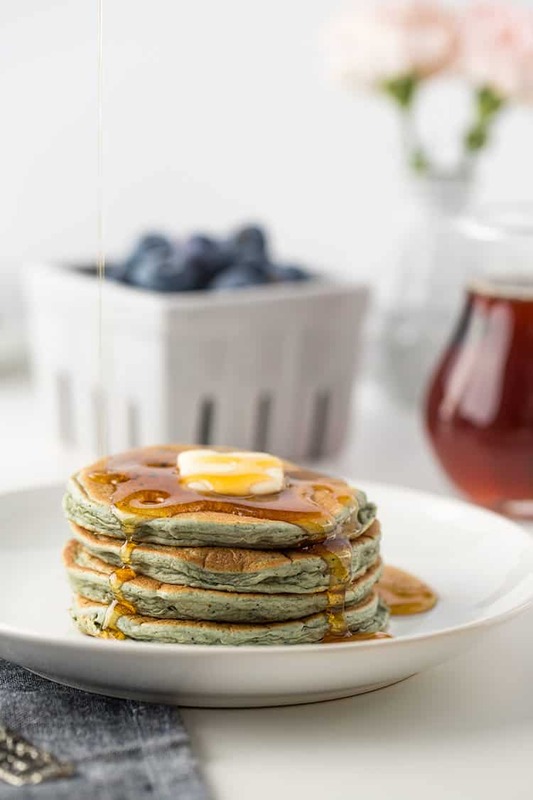 These Leftover Oatmeal Blender Pancakes are a great way to use up leftover oatmeal and add fiber to your morning pancakes! They freeze fabulously, so go ahead and make up a large batch and freeze the extras for a super-easy, super-fast future breakfast option! Place all ingredients in high-powered blender in the order listed. Pulse on high, or blend on batter setting (if your blender has one), until mixture is combined and smooth. (You may need to scrape the corners a little.) If your batter is a little thick, you can add another tablespoon or two of milk until you reach your desired consistency. Pour batter into skillet or onto griddle, about 1/4 cup per pancake. This will make pancakes that are approximately 4 inches in diameter. Cook pancakes until they are bubbly and the sides are firm. Turn and cook on other side until golden brown. Serve with butter and additional syrup, or top with fruit spread. Lay pancakes in a single layer on a large sheet pan and freeze for 2-4 hours (or overnight) before later placing in ziptop freezer bag(s). This helps keep them from sticking to each other and makes it easier to pull just a couple out of the bag when needed while leaving the rest in the freezer. Remove frozen pancakes from freezer bag. Place on microwave-safe plate, and heat in microwave for 45-60 seconds for 3 pancakes. Or toss them in your toaster for a fun toasty treat! * You can use just about any dairy-free milk substitute here. I generally use unsweetened coconut milk, but you could also use vanilla almond milk as the flavors will blend well with the maple. ** You can use 1 tablespoon sugar instead of the maple syrup, if you are not restricting refined sugars. Funny enough every time I make oatmeal for the fam we have a bunch of leftovers, so this recipe is like a blessing to me! what a fab idea, and the pancakes truly look so fluffly and tasty! I don”t have a griddle. WOuld these work as pancakes? Yes! You can cook them just like regular pancakes. If you don’t have a griddle, you can use a skillet or frying pan.